In 2004, she married Iaon Cottrell, who began managing the practice in 2003, thus making West End a family business. She enjoys hanging out with her husband and their two dogs, CZ and Juliet. She and Iaon have had a succession of hobbies and sports, and are currently having fun doing obstacle racing and playing disc golf. Dr Cottrell also enjoys writing, cooking, and reading science fiction. When not at work, Dr. Hampton enjoys spending time with her husband (also a veterinarian) and their 5 fur children (3 dogs, 2 cats). Her hobbies include running, obstacle course racing, camping, and hiking. When not at work, Dr. Schirmer enjoys spending time with his wife (a teacher), nine children, and seven grandchildren, as well as Annie, his ferocious guard dog, and multiple grand-dogs and cats . Together they enjoy Gator football, traveling to the beaches and mountains, and family gatherings at holidays. In his capacity of Justice of the Peace, Dr. Schirmer has performed the wedding ceremonies of Debbie & Iaon Cottrell and Erin & Matthew Hampton, as well as those of several of our technicians. Dr. Claire Stevens grew up in Southern California and graduated with a BS in Neurobiology, Physiology and Behavior from the University of California, Davis in 1999. She received her DVM from UC Davis in 2005. 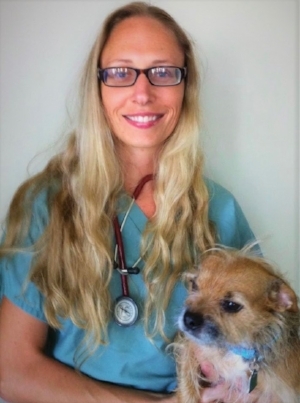 She completed a year-long internship at East Bay Veterinary Specialists in Walnut Creek, CA in 2006 and has since practiced in California, Texas and Colorado doing both emergency medicine and small animal general practice. She particularly enjoys dermatology, internal medicine, and feline medicine. She has been an invaluable part of the West End team since 2012. Dr. Stevens has been married since 2006 (her husband is also a vet). They have a human son, who is always at the top of her list of “hobbies”, but she also enjoys cooking, 80’s movies, hiking, veggie gardening, and traveling when she gets the chance. Their animal children include a Pit Bull mix (Jezebel), a Border Terrier mix (Olive), and 3 amazing cats (Blueberry, Butter and Kevin).